There's a selection of onboard cabin accommodation in a choice of 2, 3 or 4 berth as well as reclining standard class seats in a lounge with a communal TV screen. You’ll have plenty to choose from when it comes to eating onboard the Juan J. Sister. There’s an a la carte restaurant, a self-service restaurant with a wide range of dishes to choose from. There's a selection of delicious coffees and refreshing drinks on offer in the ship’s bar/cafeteria and snack dispensing machines are available throughout the crossing. Indulge in some retail therapy while onboard the the Juan J. Sister in the self-service duty free boutique. You'll also find an outdoor swimming pool and a sun deck to work on your tan or if you want to do some exercise during the trip, then head over to the outdoor jogging track. The ship's WiFi connection allows you to get online while onboard, you’ll be able to play cards or board games in the game room, relax with a book in the reading room, watch the news in the TV room or dance the night away in the disco/nightclub. 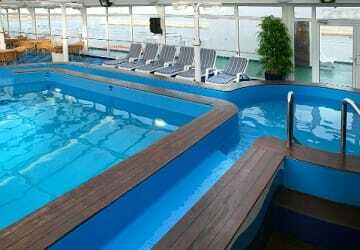 Children will be able to enjoy the outdoor swimming pool accompanied by a responsible adult. 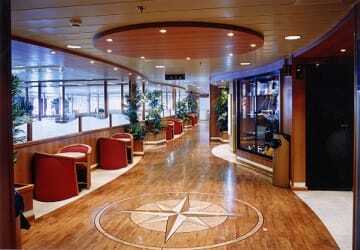 There’s also a children’s playroom to keep the little ones entertained during the crossing. The ship has specially adapted cabins and toilets for passengers with reduced mobility, as well as ramps to facilitate mobility onboard. If assistance will be required onboard then it is advised to inform us prior to booking to make sure that your needs can be accommodated. Guide dogs travel free of charge. Please Note: Whilst we have taken great care in making our Juan J Sister guide as accurate as possible, onboard facilities, services and entertainment may vary depending on the date and time of year that you travel, facilities mentioned may change without notification and ferry companies reserve the right to operate vessels other than those mentioned at time of booking without prior notification. "barcelona > Ibiza > Barcalona"
The entrance to the ferry port in Barcelona was not easy to find. A small entrance with a flag made things even more unclear. We drove by three times which was odd as I travel quite regularly with many ferries from here. Outward trip was fine. Food and drinks are not too expensive. Cabin as well, as you would expect. Return trip; again, we had to search for the port Entrance. The signs in the several languages arent very clear. Furthermore, 1 port in Eivissa is run by 2 operators. The offices are not clearly separated. There was a storm on the way back and my wife lay asleep, miserable like a tamed bird in a cage because was sea sick but she got better when we arrived at the port. This ferry was better than the others, so, recommended. 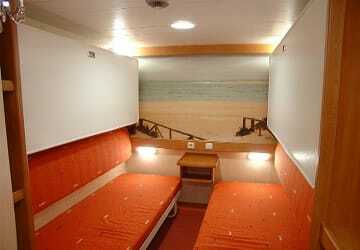 "Journey Bacellona Palma and return"
The journey it was quiet nice, the ship is big and comfotable, kind and helpful, 2berth cabin ok, fast boarding and landing,, on the return 30 minutes dalay, because there were heavy vehicles. The experience it was quite good, nothing to complain about. Nothing to say about the reserved seats. 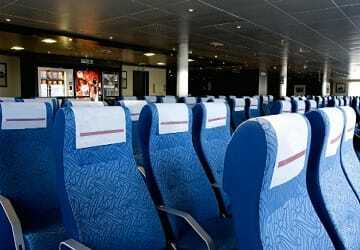 Only thing (and also the most important) is that seats are located close to the doors to go outside on the deck. All night people came and go through. Plus the doors are relly noisy. Next time I will go for a cabin. The chairs were comfortable. It would be amazing if they could recline but I can't complain. The television was turned off when it was time to sleep and the attendant came by regularly to check up on everyone. I would travel with this company again. 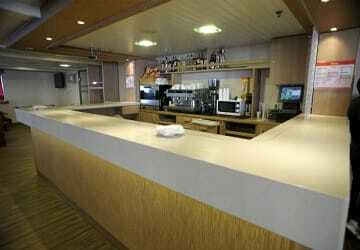 "Barcelona - Palma de Mallorca - Barcelona"
In terms of the ship and staff it was all good. Very professional. 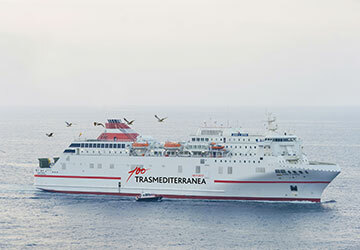 The only thing that may be slightly unusual for UK users is the concept of checking in outside the port at the Trasmediterranea office before you enter the port proper. It wasn't a problem once we'd sussed it out but a new one on me at any rate. Coming back from Palma was the same with the added spice of the departure being from the Commercial dock at the other end of the port to the regular passenger dock. This was explained at check in (at the passenger dock) but it did mean another trip back through Palma to the Commercial dock that I'd ridden past 20 mins before. Also the signage for dock entrances in Palma is non-existant especially round the left-hand slip road you need to take to do the right turn into the passenger dock. Non of that is Trasmediterraea's fault tho. I am impressed by the cleanliness and the service. It's pricey though…. I would recommend it. Easy booking over the website. Easy crossing. Fortunately the weather was good too. No complaints! The journey to Melilla was very good. There were no big waves so the ship didn't move that much. It arrived on time to Melilla. The return was as good but during the night. The arrival in Malaga was also punctual. A great company, the boat was beautiful, clean and well organised. I'm proud of this crossing. I was very satisfied with the boat and with the crew. However, it's a pity that we have to queue in the same line than people buying the tickets on the same ticket. Purchasing the ticket on your website is very quick, but it takes 2h30 to have get the physical ticket. I won't even mention the fatigue, the heat and the cries. Everyone is pushing and you worry about the children who are alone in the car while you get your boarding passes. Please open a ticket office for the people who have already booked their tickets. Thanks. My only advise is to use directferries.